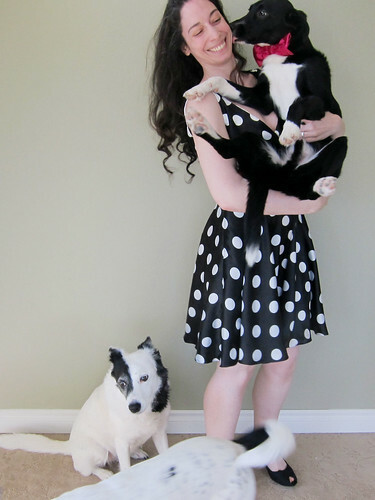 For someone who rarely has occasion to wear anything fancier than pajamas and even fewer occasions to wear anything fancier than jean, it might be a little weird to love to sew dresses so much, even if it's a fun polka dot dress with a pink sash. But you could always chalk that up to being more into the process than product of one's craft. If Leo divorces me and takes Darwin with him, you'll know why. It was worth it, though. I understand the dress love, and I'm in the same boat as far as practicality. I don't sew them though (yet). I scour 2nd hand and vintage stores. I find things even more awesome but less practical that way. 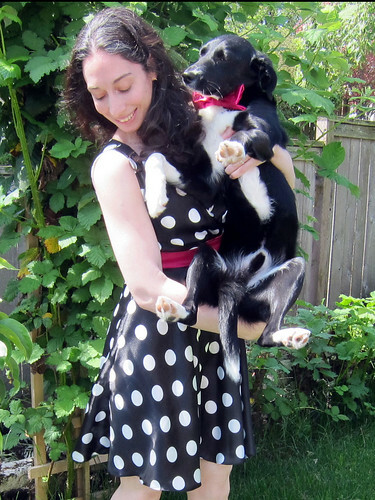 I love your newest dress, and I'm thinking of doing the online sewing course you took. I might have some time this summer and it looks super fun and just challenging enough. Have you done any other online sewing courses since the couture dress class? Do you find yourself re-watching portions of it as you tackle other projects? You're a very inspiring lady. Leo should be glad you didn't ask him to wear the bow tie. And how amazingly cute are you in that Betty Boop dress! 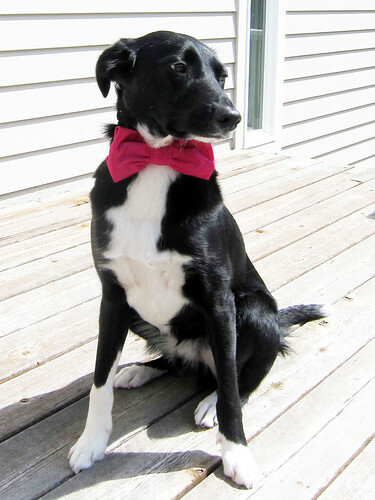 Darwin looks VERY handsome with his hot pink bow tie. And he also looks not at all unhappy. you guys are all so stinkin' cute! If Leo and Darwin ride off into the sunset together, leaving all you girls together, you'll know why. This page contains a single entry from the blog posted on May 15, 2012 11:51 AM. The previous post in this blog was Past the point of no return. The next post in this blog is Signing Digital Contracts: Creating a Signature.